Many people have a “Go-To” restaurant; A restaurant that you visit where you absolutely know that you will have not only a delicious meal, but something that you cannot get anywhere else around you. Everyone needs a restaurant that will deliver more than just a plate of food, but a real meal experience. 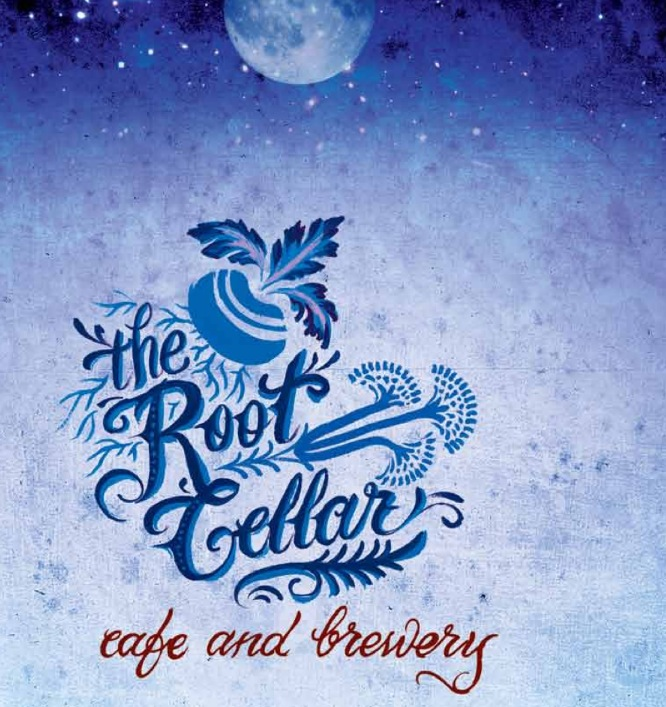 Personally, For a long time, The Root Cellar Cafe and Brewery has filled this role without much competition. 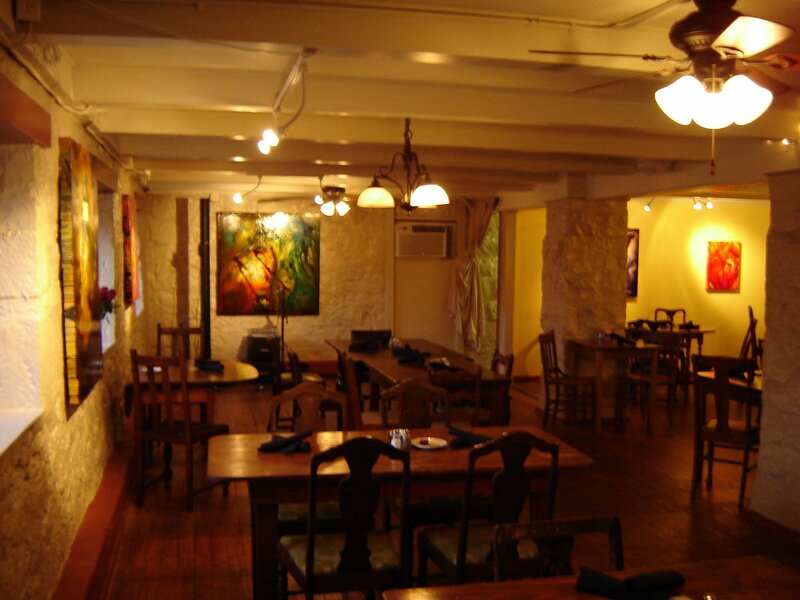 Within The City of San Marcos, there are few restaurants that can match the caliber of Chef and quality of food that the Root Cellar Cafe delivers every day. I have been coming to this restaurant for years now and that is not like to change. One can tell after just a few visits that 1) These Chefs love what they do and 2) these people really care about their diners. 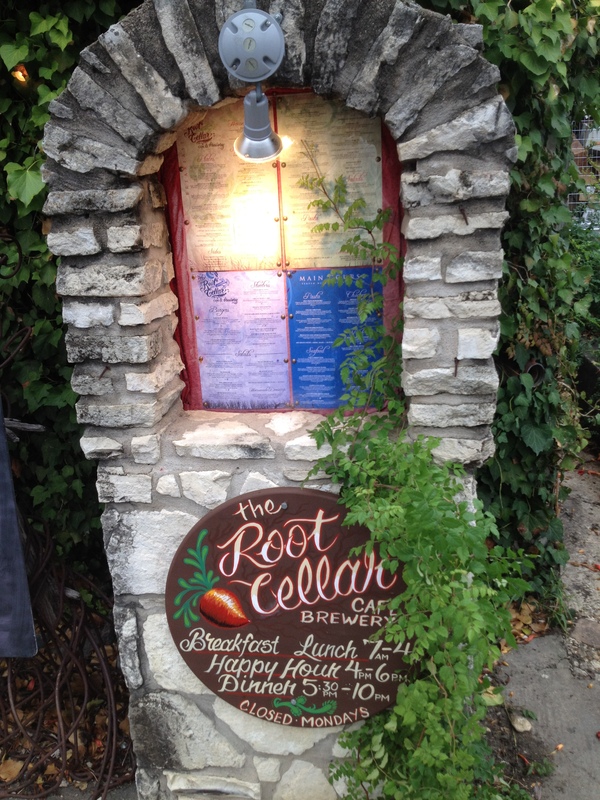 If it is a special occasion, or I just want a really good meal guaranteed, I dine at The Root Cellar. This restaurant opened in February of 2005 and had pretty sparse hours for a while in order to form what their restaurant would become and what food it would serve. After a while, they had created a fixed, permanent menu and had steady day and night operating hours. They even decided to open up a Food Cart in the middle of San Marcos across from Sewell Park. They have become quite a staple in San Marcos, certainly not without much merit. Not only is the food quality stellar, but there are new specials for lunch and/or dinner pretty much every day. I am not just talking about a dish slightly different than the regular menu every now and then.. I am talking about chefs creating some real inspiration on a plate every day of the week from a very diverse mix of cuisines and flavors. Check their Facebook page as they post pictures every day of their craving-worthy specials.. They also offer a great “Happy Hour”.. Happy Hour is from 4pm-6pm. It’s a $2 dollar happy hour, so $2 off appetizers, house wines, mimosas, homemade sangria, all beers (including home-brewed beers). On Sunday nights, happy hour is all night, so 4pm-10pm! The kitchen at The Root Cellar is under the leadership of Executive Chef Megan Turbeville and Executive Chef Bryan Oden, but I have been informed that everyone in the kitchen has been thoroughly trained for each station and role so that there are no weak links in any night’s service. This is beneficial to have a kitchen not reliant on one or two individuals who know what they are doing, especially on hectic nights. And I will note that The Root Cellar definitely handles crowds quite remarkably without sacrificing quality. I often ask people when they go somewhere else ,”Why didn’t you go to The Root Cellar?” (Seriously..)The very Classic yet bold flavors and continuous creativity that goes into all of the Daily and Nightly Specials and the regular Menu items represent a level of quality that is severely lacking in many other dining establishments. I really have to say, at least for me, they do everything, and I mean everything pretty much perfectly.. In the case of The Root Cellar, balanced seasoning, appropriate and tasty sides, fine-dining presentation, and consistent execution are among the things you can expect. Their breakfast is in a word, “heavenly”, with options like the ridiculously flavorful Baked Frittata that happens to be my brother’s favorite, some of the best coffee in town with fresh milk instead of artificial creamers, Homemade Blueberry Jam, and of course the incredibly delicious breakfast simpler which I will be reviewing a little further on. The lunch and dinner menus are always full of really delicious dishes as well, such as the Tortilla-Crusted Tilapia or the Basil-Swiss Burger. In Addition to the food served, there is also seasonal Beer brewed and served in-house. 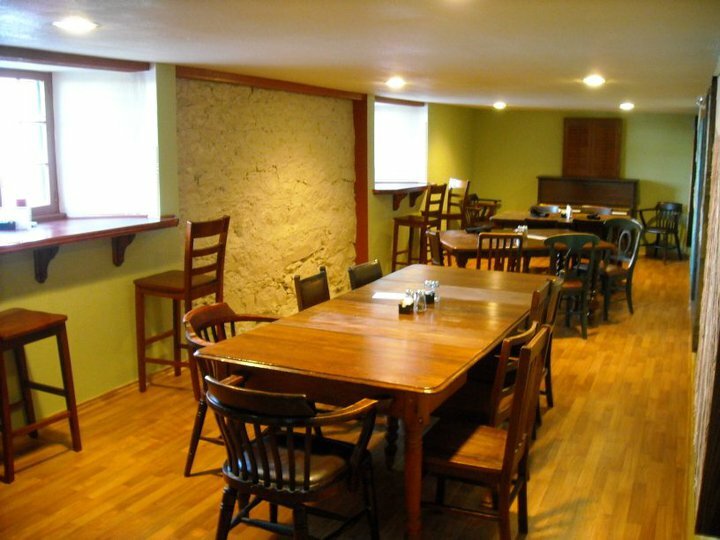 The Root Cellar Cafe constructs quite successfully an atmosphere in which diners can feel at ease and truly enjoy themselves. The dining area furniture is composed of antique chairs and tables that are just beautiful and almost reminiscent of an old country household dining room. I say almost because I would bet that an old country dining room would not feature some of the spectacular art created by local artists. “Resident Artists” Joseph Cohen and Aron Williams feature their creations and sell them exclusively at the Cafe. This feature I especially appreciate because there is usually new art every few visits, adding another welcome element to the dining experience. Additionally, The atmosphere is even more ambient and romantic at night. If you are thinking of having a “Date night”, this is a restaurant you should seriously consider. I must add that the service and staff are all very nice, welcoming people and I have always appreciated the service at this restaurant. 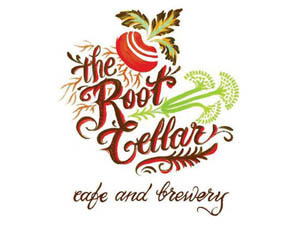 The Root Cellar Cafe and Brewery is located centrally, right in the heart of the City on The San Marcos Square at 215 N LBJ Dr. This location is very convenient for most any time of day as there is usually parking in several places near the restaurant. The restaurant operating hours are 7am-10pm Tuesday-Sunday. This restaurant is a perfect choice for families, pairs, or groups of any size. Further, if you are dining for one or two, they offer delightful window tables that are especially great in the morning for breakfast with the early light coming through the windows. 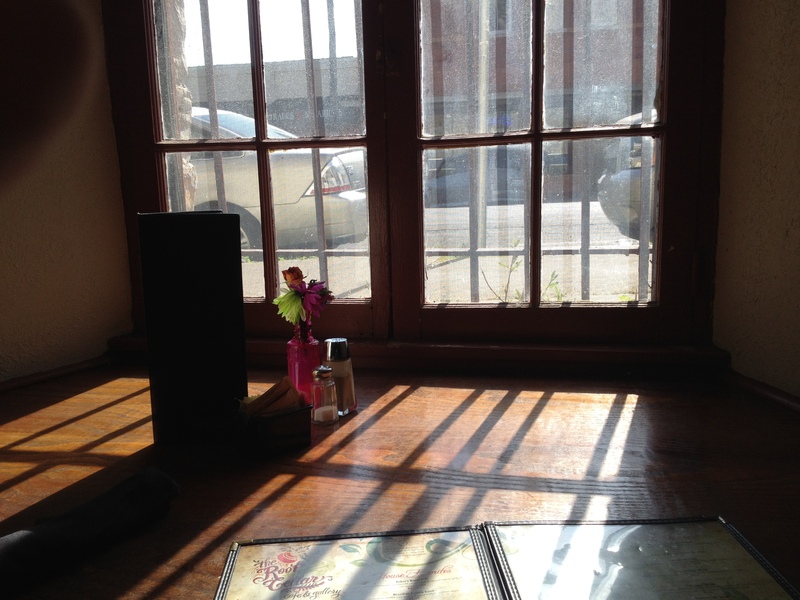 Having coffee and breakfast with a friend or my brother at one of these window tables are among my fondest recent “dining memories”. I guess it is only natural to begin my food review section with Breakfast. I will start with this. Most in the culinary world would agree that at least one of the marks of a great chef is the ability to cook an egg perfectly in any way a diner may request. This would obviously include anything from a sunny-side-up, a poached or fried egg, soft or hard-boiled, or my personal favorite.. Scrambled!The thing you have to know about the Root Cellar, and the main reason I go for breakfast, is that they can do this quite successfully. Most places may cover up their eggs with all sorts of spices and gobs of cheese etc.. but not here. I do not enjoy plain eggs at almost any restaurant because they are often cooked either too long or not long enough or with an inappropriate oil that does the opposite of complementing the flavor.. I cannot tell you how much I enjoy having this for breakfast on weekend mornings. 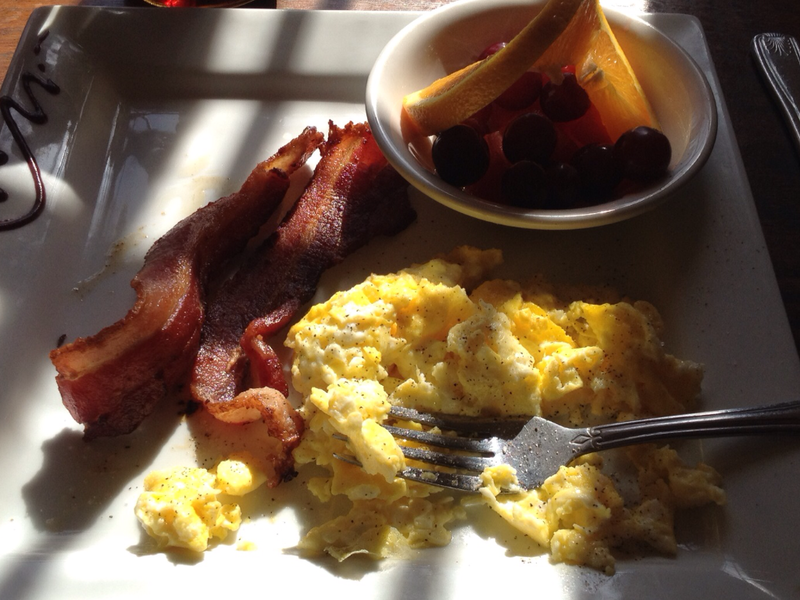 The bacon is always, just as the eggs, cooked so well that I almost have motivations to order extra sides of it. I also appreciate a great deal that the fruit is included, always fresh, consisting of watermelon and gapes with an orange slice. I always like to eat fruit with breakfast and this selection of fruit in particular complements the already fantastic breakfast items accompanying it. 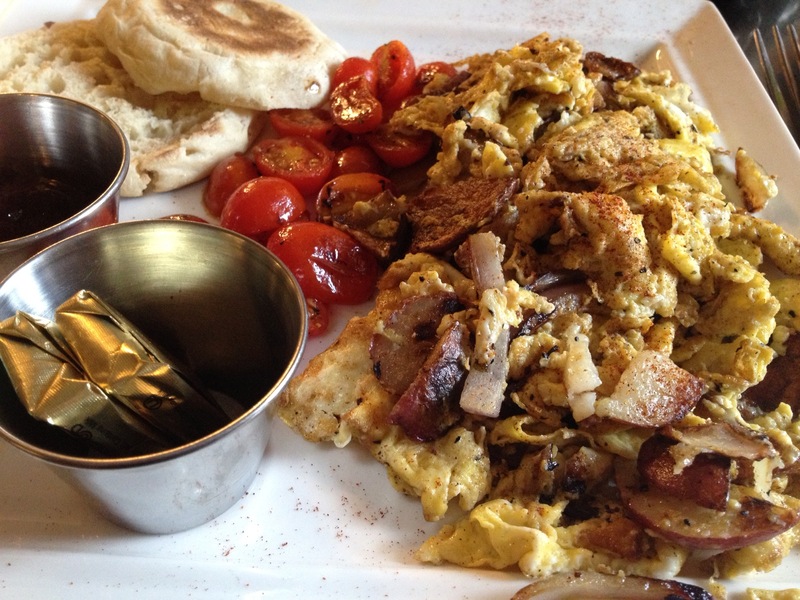 Diners have a choice of toast, an English muffin, or a bagel. 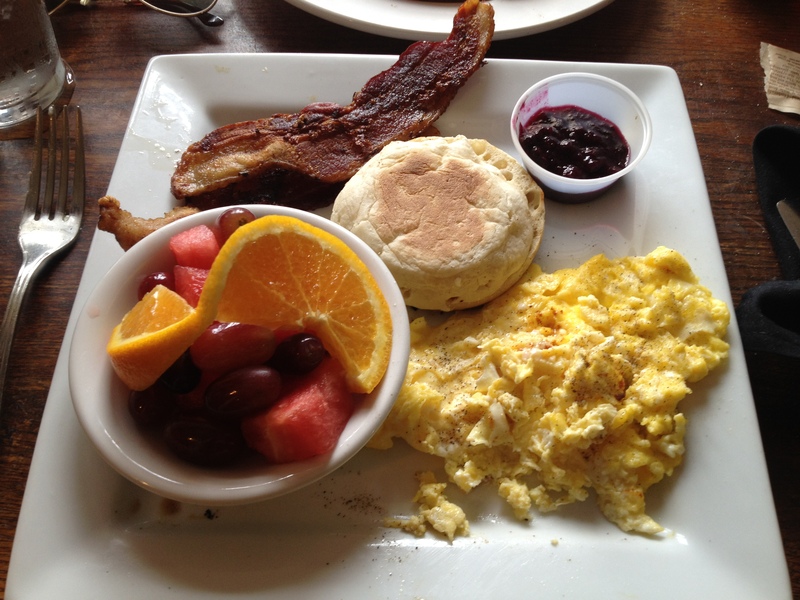 I recommend the English muffin mostly for the fact that the homemade blueberry jam is really really good. And honestly, there are some things I would suggest accompany this dish.. 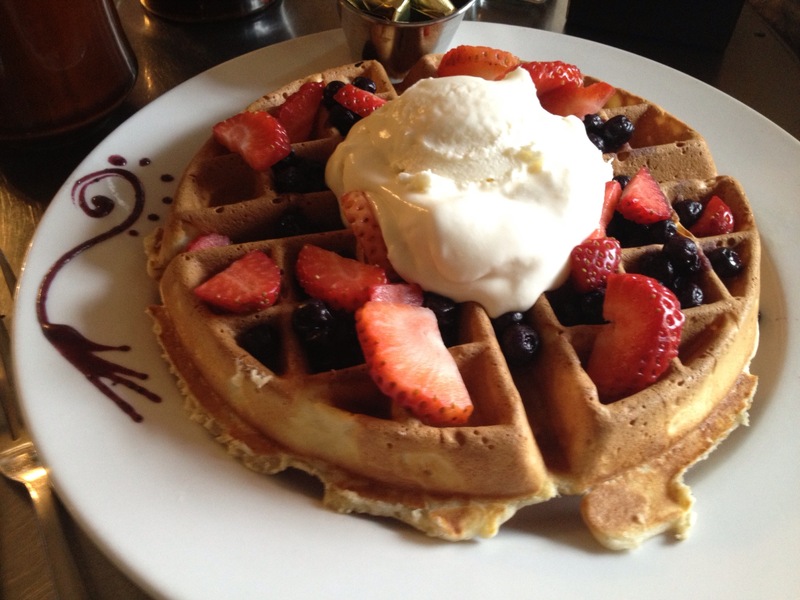 I always get coffee and one Belgian Waffle with Blueberries and Strawberries on top. This really completes breakfast for me.. 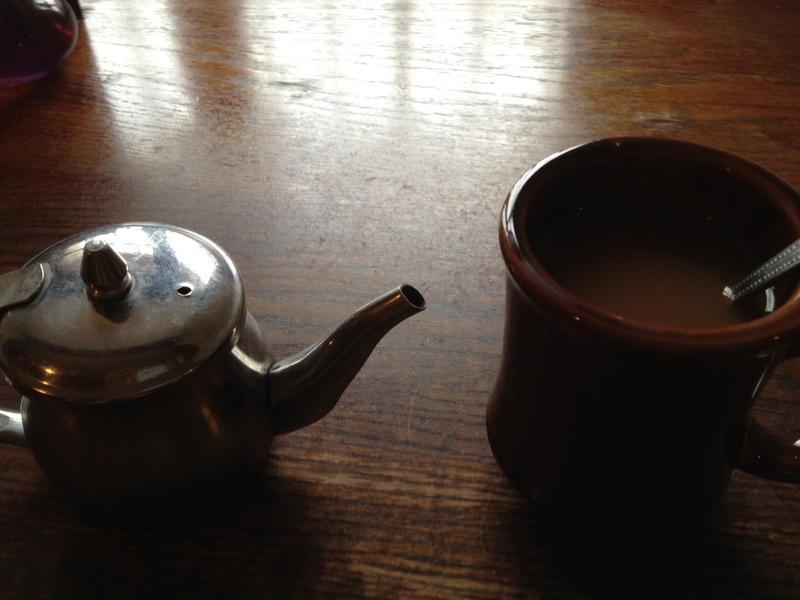 The coffee seriously is so good, and as previously stated, diners are provided with real milk with their coffee. I always loved that. And the Belgian Waffle is, again, cooked perfectly. It is light and crispy on the outside and very moist with just the right level of sweetness on the inside. Additionally, the strawberries and blueberries add such a nice touch and are always very very fresh. 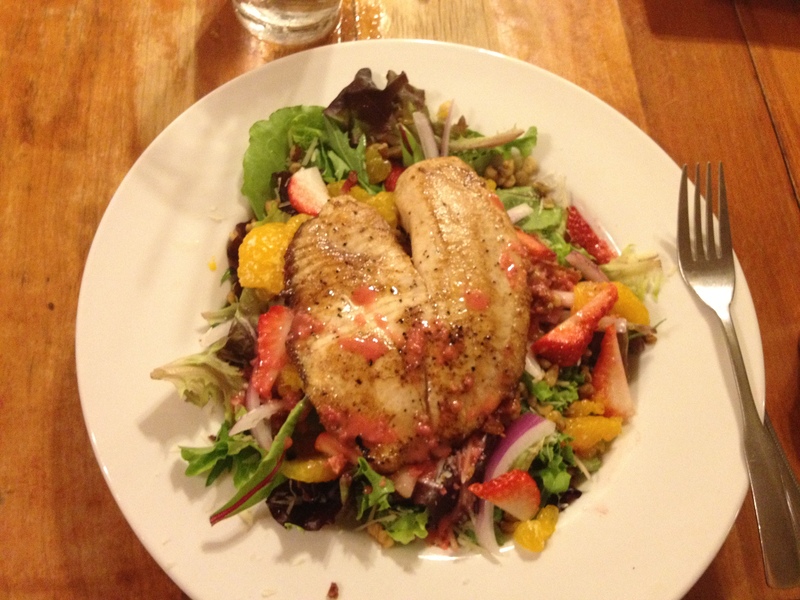 Not surprisingly, it really is a wholesome meal as well as an incredibly delicious one. One can tell very quickly that the ingredients used in these dishes are fresh and of higher quality than I am used to at most restaurants. Further, the care with which each food item is handled and presented is very apparent to anyone. 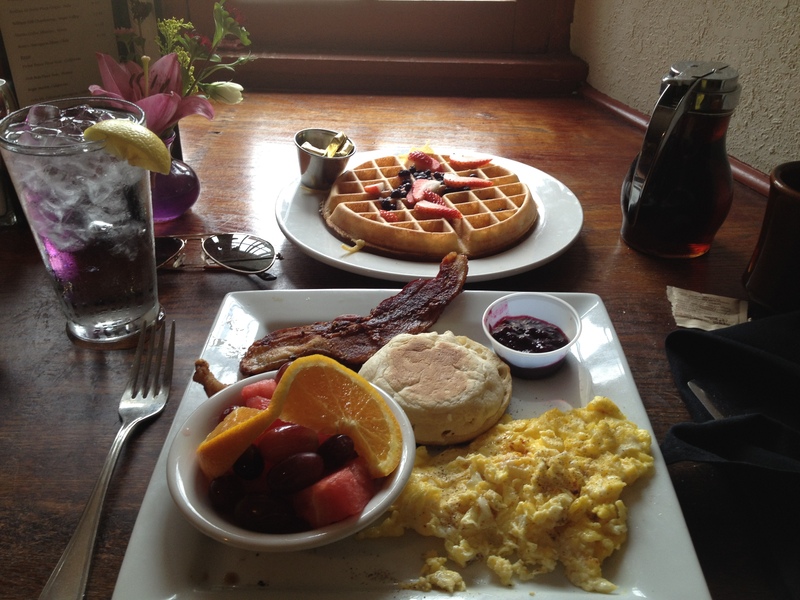 the bitterness and richness of the coffee mixed with the sweet and savory breakfast sampler, waffle, and fruit is quite a way to start any day. Yes, this is very simple stuff one might suggest, but everything is done with such care and precision. That is key I suppose. Further, you are not getting tiny portions either, so don’t worry about that. 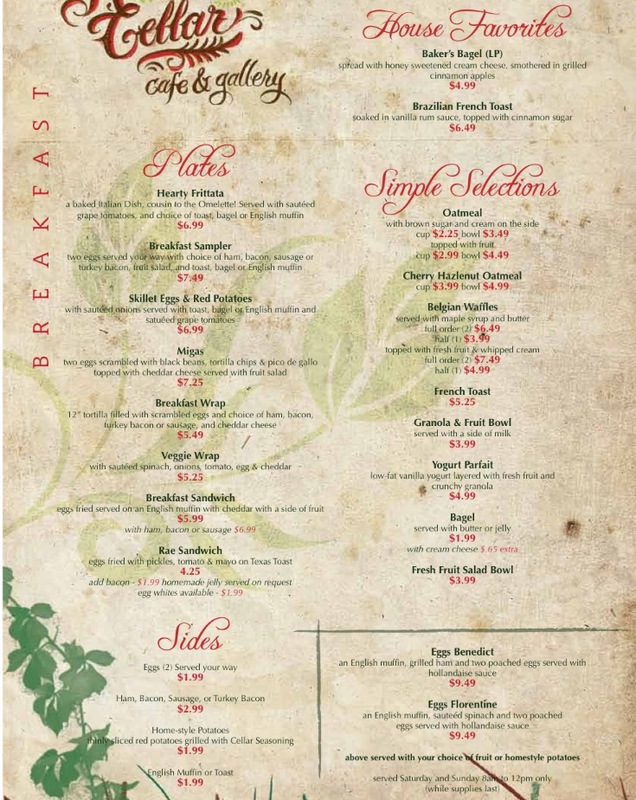 The breakfast menu is also much more extensive then just my single tastes.. I am very impressed with all that they offer for breakfast. There really is something for everybody. Oatmeal, breakfast(and veggie) wraps and sandwiches, a wonderful Eggs Benedict.. you get the point heh: Get some breakfast here! 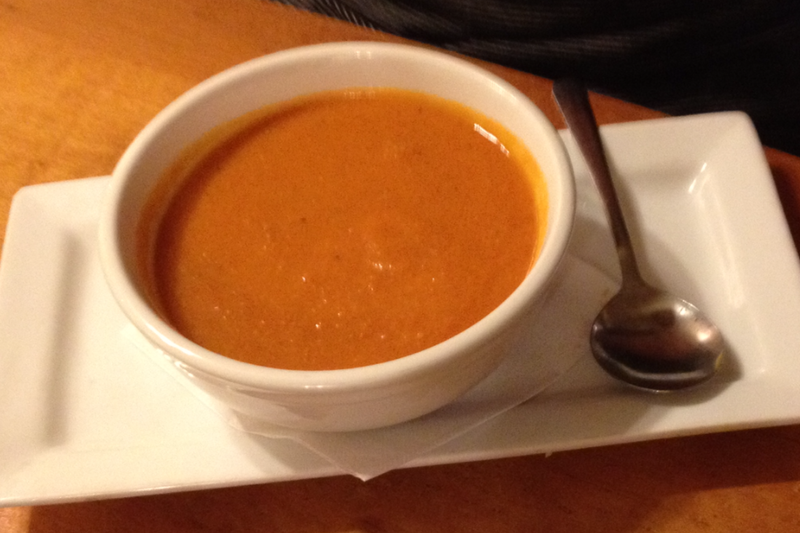 What I decided to do was to go on a random night and try the “Special”, both the soup of the night and the entree. This soup was balanced so well. The flavors were clearly cultivated slowly over a period of time and the attention to detail that I have come to associate with The Root Cellar is, in a large way, exemplified in this dish. Just clear, bright flavors with the sweet and savory tomato blending in such a subtle way with the sharp and tangy garlic and a slight hint of cream. Balance is so very important and I would eat bowls and bowls of this soup. That is exactly what you can expect from this restaurant. This was the first time in a while that I ordered Tuna at a restaurant and the last time did not go all that well.. Of course, considering where I was dining, I optimistically ordered it anyway. I was so impressed with this dish!!! the Tuna was cooked perfectly and the crust was so peppery(in a good way) and brimming with a beautifully savory layer of flavors. This Tuna was so utterly juicy and flavorful. 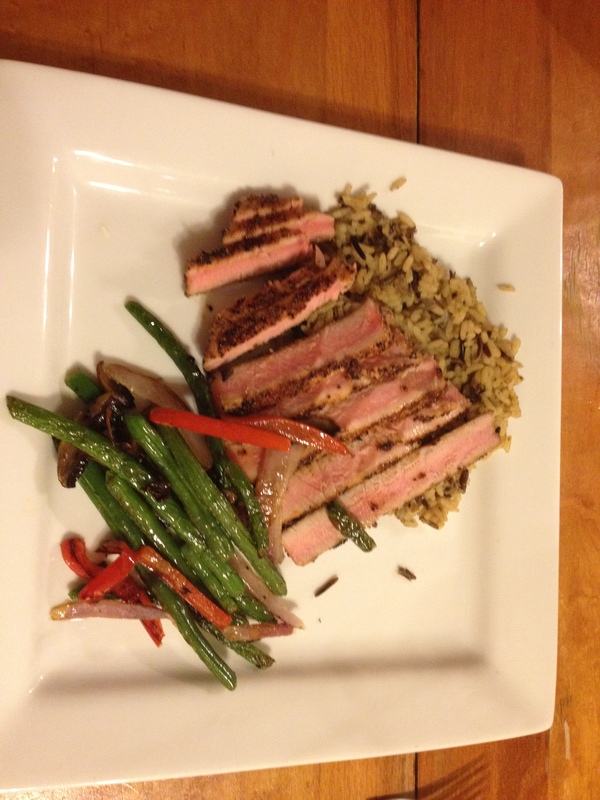 I was so happy with that alone, yet accompanying this Tuna was a very tasty wild rice and vegetable blend that, when all eaten within the same bite, just exploded with bold flavors that I look for so often yet do not find. This dish was spectacular. A “Special”, indeed. This dish is exactly what I am talking about when I suggest diners are getting more than just a plate of food, but a real meal experience. This dish is very unique and it is the best dish I have had the pleasure of eating in quite a while. One can pretty much tell by now that this restaurant is the place to go for some really amazing food that is actually worth the money you pay for it. Remember, though, that there is so much more to taste here every day than what I have reviewed.. 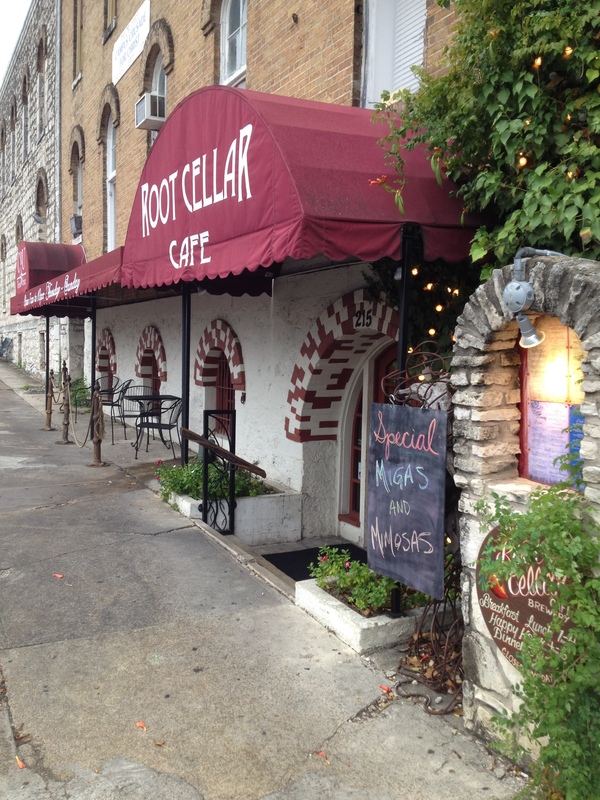 So, In Closing: The Root Cellar Cafe is one of the best restaurants in San Marcos and the larger Central Texas Area. If you have not tried it.. YOU MUST! 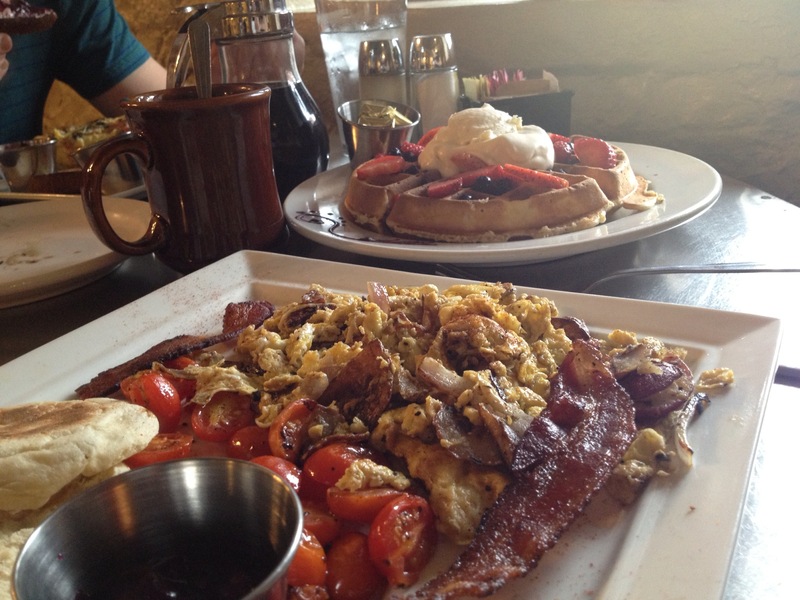 The San Marcos Food Blog wholeheartedly endorses and recommends this restaurant to anyone and everyone. If you know about it, TELL A FRIEND! too many chain restaurants and restaurants that put no effort into what they produce are packed with lines.. once again, the goal of this blog is to counteract this. It’s rare to find somewhere that does a homely atmosphere with really well presented food – I find anyway. Seems you have a gem, here.